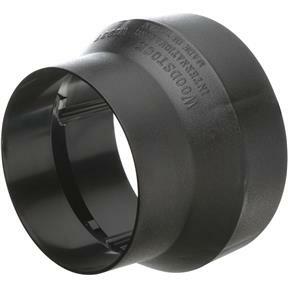 These fittings provide a step down from a larger main line to smaller branch lines. This step-down increases air velocity near the machine where it's needed most. Made with Anti-Static Additive! Hard to find tapered reducers 5 to 4 inch in plastic that fit 5" dust collection hose. This worked well at a good price. It works well with the Grizzly 5"hose. I am not sure how it would fit other hoses. Ordered a 20" planer two months ago, still haven't received it yet. When I do I am sure that this reducer will be just great. Let you know when that happens. I purchased this for my planer and I wouldn't fit. So duct tape made it work.